It’s official — I live in a disaster area. And for once, that’s not a reference to my housekeeping skills. I’d tell you the name of the disaster, but it doesn’t have one. It probably never will. Other wind-related events, like tornadoes and hurricanes, get names. So do earthquakes and wildfires. 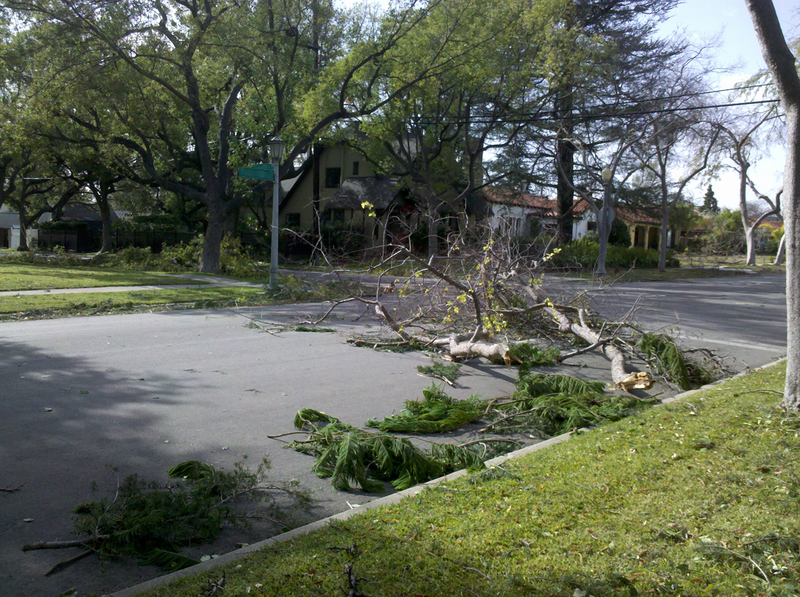 We even named a scheduled three-day freeway shutdown — but not this windstorm. Is that fair? I don’t think so. It’s time to show it a little respect; from now on, I’ll be referring to it as That One Night It Got Really Windy. I was completely unprepared for That One Night It Got Really Windy. When I left work that one night, I noticed that it was, in fact, really windy — windy enough that, on the way to my car, I had to put more than the usual amount of effort into standing upright and maintaining contact with the ground — but the significance didn’t really hit me until I reached my neighborhood and started seeing severed tree limbs everywhere. My nearest street corner. It was a fun drive home. I got home at about 9:30 pm, and the power was out on my block. But that was okay, because I have a super-fancy flashlight / lantern combination, and I knew exactly where it was. I went right to it, flipped the switch — and nothing happened. I decided to go to the store to get batteries for my flashlight and matches for my stove. The three-block walk to the supermarket was amazing. Leaves were flying everywhere. Trees were moving in ways I’d never seen them move before. At one house, the festive holiday decorations had been beset by tragedy — one wireframe reindeer had a broken neck; the others lay, lifeless, on the ground, as though, in a senseless act of workplace violence, one of Santa’s elves had gone on a murderous rampage. Three blocks from my house. This tree used to be bushier, and more vertical. Same tree, from the front. I'm pretty sure the huge piles of greenery on each side were cut from the tree after it fell. At the store, I bought batteries and, on impulse, two additional flashlights. I didn’t realize it at the time, but this was the beginning of my descent into flashlight addiction. In the two weeks since That One Night It Got Really Windy, I’ve bought five flashlights. There was a practical reason for buying at least one of them — I used it on the walk home. When I went to replace the battery on my lantern, I discovered that it actually has three switches, and the one I’d flipped in the dark earlier was the wrong one — the battery had been fine all along. I’d forgotten to get matches, so for dinner, I feasted on cheese and crackers, fruit, and chocolate. I used my cell phone to check on the status of the power outage — something I’d be doing pretty frequently for the next day and a half. The power company has an “Outage Center” web page that shows the status of outages, but every time I looked at it, I’d momentarily think it said “Outrage Center”. I’m not sure whether that’s a reflection of my emotions or whether I have some sort of undiagnosed learning disability that causes me to see Rs where there are none. I’m leaning towards the latter explanation, because I also often misread the title of the Cute Overload web site as “Cute Overlord”. Throughout the storm, my cats kept alternating between being a little freaked out by the howling winds and being fascinated by the flashlight beam as I moved from room to room. Eventually, I settled into bed with my Kindle (the case has a built-in light), with one cat on my lap and the other by my side. It was pretty cozy. 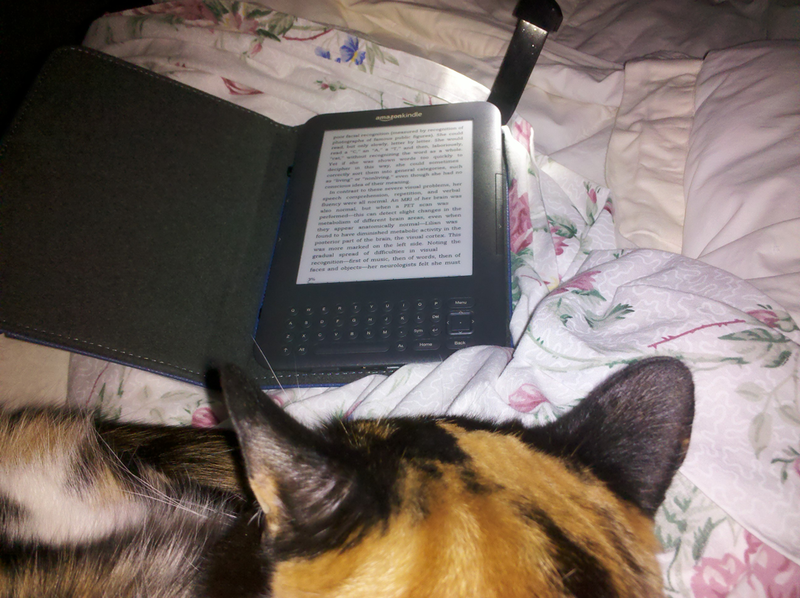 A cat, a comforter, and a Kindle -- what more do I need? In the morning, the winds had died down, and the power was still out. I looked out my kitchen window and saw my neighbor’s back yard — which was odd, because there’s normally a fence separating our properties. A chunk of fence was missing on the other side as well, along with lots of roof shingles and some branches from a tree in the front of the house. 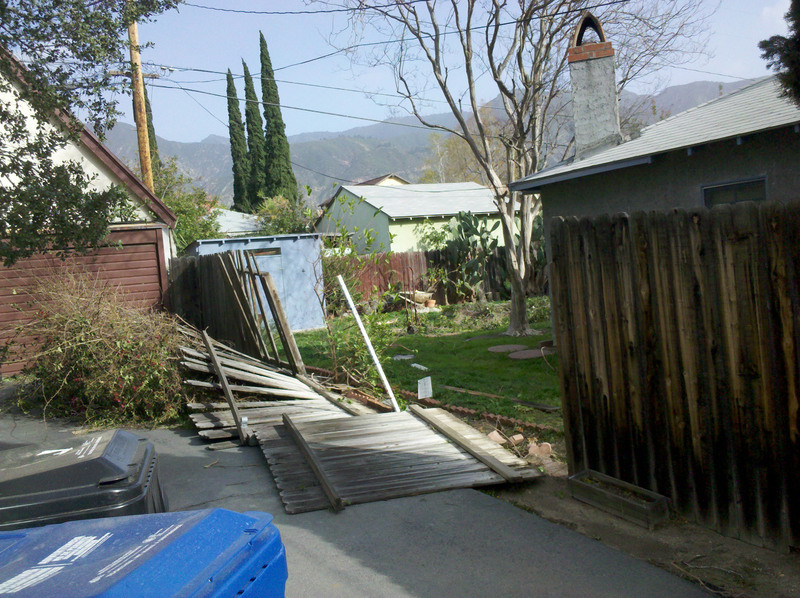 This fence is less effective than it once was at keeping my neighbor's dog in his yard. On the bright side, my insurance company will soon be writing me a check for more money than I’ve paid in premiums over the years. I think that means I win at insurance. My parents live in Southwest PA and wrote me an email this morning saying because of the high winds a tree fell on our garage! Where I was, there was hardly a breeze–so I can’t imagine the types of winds that would cause something like this! I’ve never experienced anything like this before. I can’t even begin to imagine what a real hurricane would be like. First, please post another picture of your cat. It looks pretty. Second, are you my mommy? She has a flashlight addiction, too. That tree that was pulled out of the ground looks huge! Here’s one of both my cats. They’re also featured in a few other posts on this blog: Rebecca Black’s Lesser-Known Cat Video, A Change of Focus (and the follow-on, Challenge Recipe 1: Chicken With Gravy, and, of course, Common Misconceptions Regarding My Cat. Maybe your mommy and I can form a flashlight addict’s support group. The upended root system of that tree was as tall as the house! One thing that picture didn’t show was all the branches and leaves that had been cut off the tree and piled up on the curb. I know how you feel. We had a “microstorm” a few years ago. 3 blocks away, fine. Our block, not so much. Wow! I was worried about the possibility of a tree crashing into a window, but it never occurred to me that one might poke a hole in a wall. Were you there when it happened? Do you have pictures? The house is about 20 – 25 feet deep. There was shattered glass from the window the tree came through all through the floor. Structurally, the entire front wall needed to be structurally reinforced. I’m really glad we weren’t home at the time! Don’t admit that you know you won at insurance….but hell yeah! Congrats, in a weird, sorry about the damage kind of way. Insurance is weird. Most of the time, if someone tells you your roof is damaged beyond repair and will need to be replaced, that’s bad news — but when an insurance adjuster says it, it’s good news. I wonder whether they have cats, because this would be the best scratching post ever. I added another picture of the same tree from another angle to show how un-bald it was before it fell. Thanks. The scene after the storm was pretty surreal — the photos don’t really do it justice. Sorry you had to go through that. A pessimist would say you have $500 worth of damage. An optimist would say you bought a $500 brick. I’ve heard flashlights are a gateway drug. Next up: lamps. Your comments are always so illuminating. I grew up about 100 miles north of Fargo, ND which I tell you in case you’d like to make fun of my ‘accent’. And because it’s tied for 13th on NOAA.GOV’s windiest locations in the US list (with an average annual wind speed of 12.2 mph). Although something tells me it was a pretty ‘slow’ year when they put that info together. I would have guessed it ranked a lot higher. I wonder how they calculate average annual wind speed. If that includes non-windy days, then 12.2 mph would be really high. I think a hurricane would be terrifying. This storm was at that magic “awesome but not too scary” level — although I was worried about one of the neighborhood cats for a couple days, until I finally saw him again. It’s good that you didn’t suffer more serious damage, but it still must have been an unsettling experience. Trees are beautiful, but not when they’re falling on you. 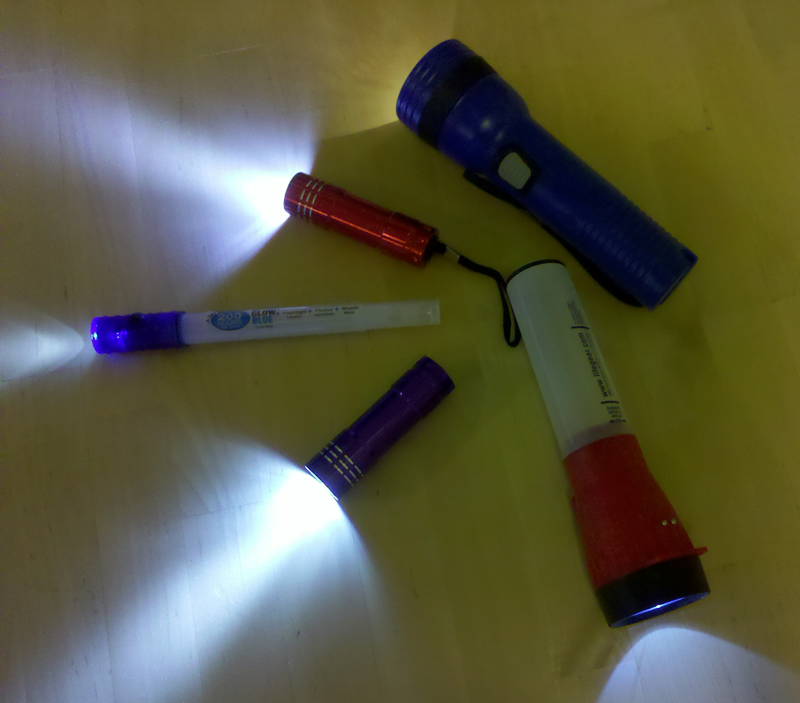 I suppose on the upside you got more flashlights (those little LED ones are very useful!) and had chocolate for dinner! !!! Yesterday was National Flashlight Day! I’m so sorry I didn’t send you a card. That’s okay. Thanks for thinking of me. I just had a quiet celebration with my family. Can you believe I didn’t even get the day off work? Good thinking buying the flashlights! Glad that you are safe! I hate the howling sound of wind!